The Tech volleyball team played with authority and nerve this past weekend, opening ACC play with a 3-0 sweep versus Clemson on Friday, Sept. 25, and a come-from-behind 3-2 win against Boston College on the following Sunday. With these victories, the Jackets posted an impressive 11-3 record, which is third best in the conference. Opening up conference play for a third straight year on the road, the Jackets were hampered little, if any, by Friday’s road trip to Clemson, S.C.
Tech had not won in Clemson since 2009, but that was meant to change this year as the Jacket’s match against the Tigers was a poaching. In the first set, Tech took a very early lead at 2-1 and never looked back, winning easily by a score of 25-17. Sets two and three proved to be slightly more difficult affairs, but the Jackets still won comfortably by scores of 25-20 and 25-19, respectively. The best performance of the match goes to the usual suspect Teegan Van Gunst, who had a double-double with 18 kills and 13 digs. 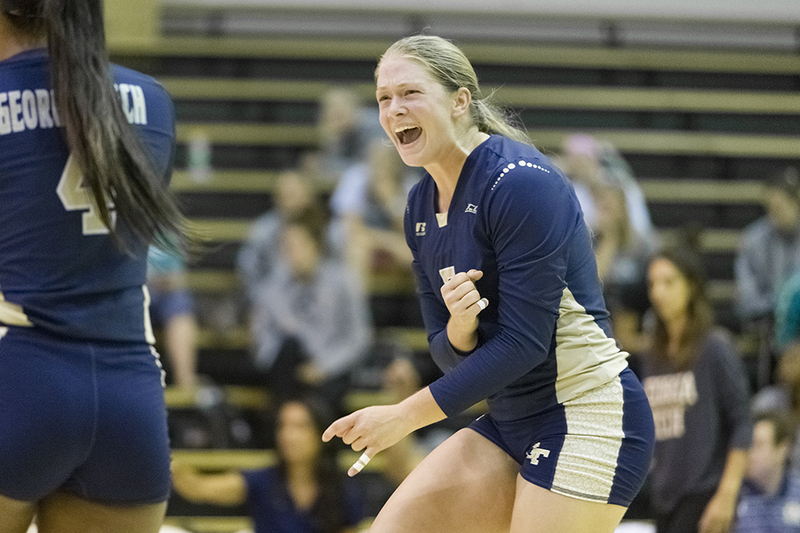 The Jackets were thrilled to open conference play in the winning column, but they could not celebrate for long as their match against the Boston College Eagles in the O’Keefe Gymnasium was scheduled two days later. After having flown south from Boston to Atlanta, the Eagles showed no signs of migration-sickness as they jumped out early on the Jackets by a lead of two sets to zero. Fortunately for the hometown crowd, the team was not fazed. Late in the third match, the Jackets found themselves under pressure, down 27-26 and just one point away from losing the match in a sweep. However, the Jackets refused to fold by rallying back to win 28-27. In the fourth set, the Jackets once again bent but did not break, overcoming a late deficit en route to a 25-23 victory to keep their hopes alive. Tech then dominated Boston College in the final set, winning 15-9 and securing their come-from-behind victory. Collier was impressed by the team’s refusal to accept defeat. The Jackets’ sensational win was a team effort led by Teegan Van Gunst, who tallied 22 kills and 12 digs, giving her eight double-doubles on the season, and Anna Kavalchuk, who was the offensive spark the Jackets needed, as she got the rally going in the third set and finished the match with 12 kills. Libero London Ackerman reached the 1,000 career digs threshold in the match against Boston College. After her great weekend performance, Teegan Van Gunst was named ACC Player of the Week, her second time this season receiving the honor. Coming off of this great first weekend of ACC play, the Jackets move forward looking to keep the winning streak alive. Heading into a weekend of two difficult match-ups, the Jackets will be concentrating all of their practice time in preparation for their away matches versus a tough Miami team on Friday, Oct. 2, followed by an even tougher, No. 17 Florida State team on Sunday, Oct. 4. This year’s volleyball team looks much better than any other Tech team has looked over the past few seasons. Given the right amount of practice, preparation and luck, this group of girls has the best chance do something Tech has not done since 2010: upset Florida State in Tallahassee.